Sarees are timeless in their appeal and talking of designer sarees, they are trendy, chic and comfortable! Every season Pothys Boutique introduces their latest collections of sarees that are put together with utmost creativity. The styles and trends may change every year but the essence of these beautiful sarees stays forever. Our range of designer sarees sparks off new trends that become a fad among the women. The latest trends in designer sarees are Half and half sarees, Lace sarees, Net sarees, Printed sarees & Embroidered / embellished sarees. This is a trend that is here to stay! They are loved for their dual colored and dual patterned looks. The pleats in these sarees are completely in contrast with rest of the drape. They are sometimes also crafted with two types of fabrics to show the differentiation. These are crafted out of fabrics like net, georgette, silk, chiffon and even higher quality cotton sometimes. 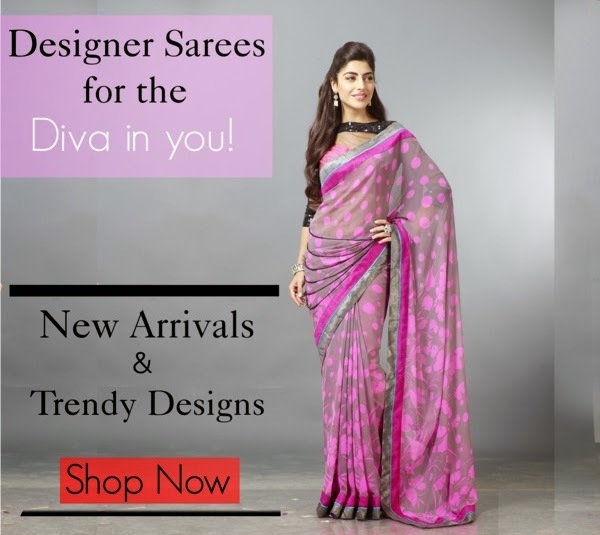 Designer sarees of this style have lots of cut work, zari embroidery, zardosi, Lucknawi embroidery, sequinned work and kundan work that sets them apart. The beauty of such sarees is accented by beautiful brocade borders that comple the looks. They are preferred by women for grand occasions like weddings and festivals. Net sarees seem to rule the roost of fashion this year. These sarees are worked with zardosi, kundan, pearl, stone, and sequins that makes them perfect for party wear. Half sarees in net are in vogue these days. They have pallus adorned with sequins or fabrics like georgette and chiffon while they are beautified by exquisite borders for stunning designer looks. These designer sarees made of lace, look amazingly stylish and feminine. They look absolutely beautiful with intricate lace designs and complemented with beautiful borders done with embroidery or embellishments on velvet, raw silk fabrics etc.. These sarees represent a beautiful mélange of Indian and western couture styles. Printed sarees usually come in chiffon or crepe. Floral prints, colour blocks and geometrical prints are in vogue this season and are also the most preferred by women. In all their versions, these sarees are perfect to drape and rock any occasion with your inimitable style and grace.